Fact Checking The Internet: Is It True or Not? “Facts” pop up on the Internet and often sound like they’re from a credible source. Here’s how to check them. Fishy headlines. Search the exact headline on Bing or Google. If it’s fake, you’ll see links disputing it. Also check Snopes.com and reported.ly. Visit the site. Go to the source site and check the About tab. See if they’re politically biased, satirical or a fake. Reputable sites have hyperlinks to backup research. Fake sites don’t provide research and may contain spelling and grammatical errors. Search photos and videos. Right click on the suspicious item and save it to your desktop, then drag it to the image or video search box on Google or Bing. This will verify the subject and where it’s appeared. Check the writer. Look on their Facebook and Twitter accounts for a blue checkmark verifying occupation and identity. Correct your own mistakes. If you post something you discover is untrue, delete it, apologize and provide the facts. Respectfully correct others. When friends or family share misinformation on social media, gently tell them where they can find the right story. Question all political ads. Companies can have a competitor’s ad pulled and demand proof of the claims made. This doesn’t happen in political advertising, where anything can be claimed with no proof required. Here’s to getting your facts straight, online and off. Enjoy a great month! Buying a house means buying the foundation, walls, roof, pipes, wires, doors, windows, furnace, fireplaces, appliances, sinks, toilets, bathtubs, showers, faucets, cabinets, door bell...in other words the whole shabang! What buyers see when they fall in love with a house is the tip of the iceberg in terms of the actual condition of these parts and systems. That's why homebuyers and sellers rely on these steps to evaluate the condition of the parts and systems of the house that are above and below surface level. The sellers’ disclosures: Sellers are required in Oregon to complete a property disclosure form which requires them to reveal the current and past condition of their house. They have to check off the parts and systems that their house contains (such as a range, oven, garbage disposal, central air conditioning, siding, roof, and the list goes on) and to indicate which, if any, of these is not operating correctly or have known problems. The seller answers five pages of questions that ask “Are you aware of” certain things about the house that a new buyer would want to know about before making the purchase. The seller is also asked about insurance claims, and any material facts or defects not otherwise disclosed to the buyer. These forms have gotten longer and more specific over the years to make the condition of the home, as known by the seller, as clear as possible. The home inspection report: Most brokers buyers get a home inspection. The home inspector will look at each of the parts and systems of the house and document and usually photograph the operation and condition of each. While the format of the reports and the specificity of their finding vary from person to person and company to company, their report will be the most detailed and inclusive. It is crucial to read the contents of this report to understand what’s going on with the house they’re buying. In addition to these disclosures, you’ll also have the appraisal report (if the buyer is getting a home loan to purchase the house), the pest inspection report if needed for a government backed loan such as FHA or VA, and the title report. If you have any specific questions about this process, please don't hesitate to give me a call. 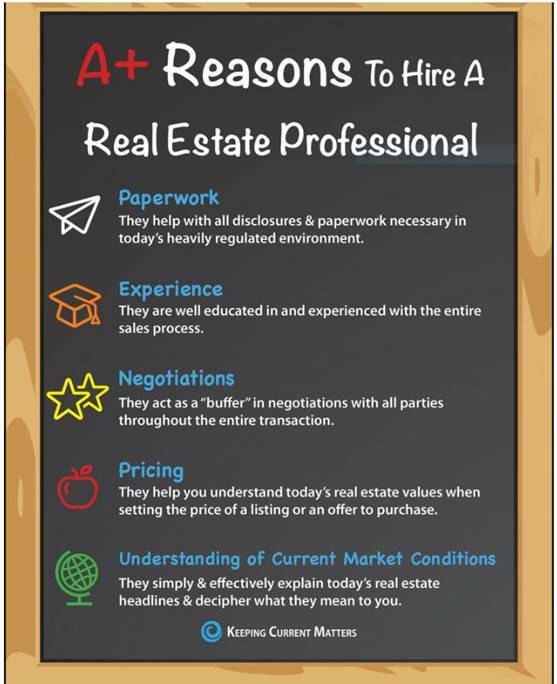 I am happy to help you any way that I can with your real estate needs. I have attached a great article below for new homeowners. Common sense should always be the general rule of thumb, but sometimes anyone of us can forget the most important things after we move into a new home. I hope you find this article useful.